Be a part of this Summer's Largest Giveaway with Beauty.com & AtHisBest.com in New York City. 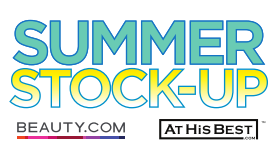 Today was Day One of Two of Summer Stock-Up so there's still time to get your hands on over 75,000 beauty samples given away to beauties, such as yourself. The decal on this van was put on this morning, according to one of the guys who worked there. Pretty!! Beauty brands such as KorresUSA, Stila and Urban Decay were on-site to give beauty tips and touch-ups. Each person who went through the Summer Stock-up area got a mini-goody bag with samples from the huge sample bin! My fave part of the evening was learning about the 5-Step regimen with MDT5 created by Somme Institute. I even talked to the President who gave me helpful insights on my personal skincare routine! Can't wait to try out their products. While waiting in line to get your goody bag, you can get touch-ups by Laura Gellar. Get bronzed and beautified!